The white supremacist Chris Cantwell, a major figure during last year’s disastrous Unite the Right rally now known as the “Crying Nazi,” has been barred from entering the Commonwealth for the next five years. On Friday, he plead guilty to assault and battery for spraying two anti-racist activists with pepper spray on the eve of the rally. 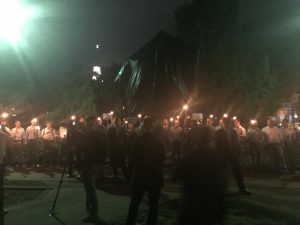 Cantwell, who gained notoriety after being featured in a VICE News documentary, used the pepper spray near the end of a torch-lit march through UVA’s campus chanting “Jews will not replace us” and “blood and soil.” He became known as the “Crying Nazi” a week later, after he posted a YouTube video on August 18, shortly after a warrant was issued for his arrest. During the humiliating video, a crying Cantwell says, “I don’t know what do,” followed by, “I want to be peaceful, I want to be law abiding.” This was in stark contrast to the felony charge he was indicted on, which has been downgraded to misdemeanor assault as part of his plea deal. 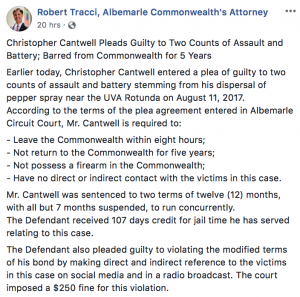 According to a statement on Facebook from Robert Tracci, the Albemarle Commonwealth’s Attorney, Cantwell is required to leave Virginia within eight hours, and not return for a period of five years. He is also barred from possessing firearms within the Commonwealth. An anniversary rally is being planned in Washington DC by Jason Kessler the organizer of last year’s Unite the Right. 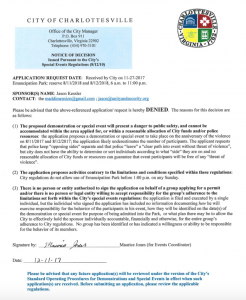 His permits have been tentatively approved and are awaiting final permission. After a recent blog post by Cantwell accusing Kessler of poor leadership, though, it seems unlikely that the Crying Nazi will be in attendance.